Root canal therapy can save your smile from tooth loss at Dental Expressions. Root canal therapy can make the difference between keeping a tooth and losing it. If you’re suffering from a serious tooth infection, this infection can eventually lead to tooth extraction if not treated. Many people don’t like the idea of root canal therapy, but with modern technology and care, this procedure isn’t as uncomfortable as you might think. And it’s a lot less costly and complicated than extracting the tooth and seeking tooth replacement. 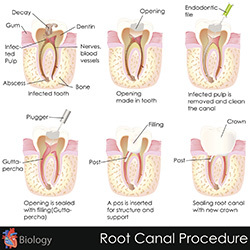 Root canal therapy is a way of treating infections of the nerve that runs through your tooth, which is also called the pulp. Infection usually gets into your tooth through a very large cavity that’s broken through to the chamber where the pulp lives. Root canal therapy has a high success rate, helping you keep your smile intact and saving you the problems that come with tooth loss. Drs. Robert and Heather Heil can perform root canal therapy at our Freedom dental office near Kaukauna. What are the signs you might need root canal therapy? Sometimes you have no symptoms of a problem, so we can look for signs of tooth infection during your regular dental exams. What causes the need for root canal therapy? Several different situations can call for root canal therapy. As mentioned earlier, decay can reach all the way to the tooth nerve, infecting the pulp. An abscess can grow at the base of the root or inside the root chamber. Or dental injury can kill the tissue inside of the tooth. The dentist will clear away the decay around the cavity and clean out the infected nerve tissue from inside the tooth. Once the infected nerve is removed, the dentist will make sure the chamber is thoroughly disinfected and cleared of toxins. Then he or she will fill the chamber and probably place a crown. This can take a couple of appointments to allow for the creation and placement of the crown. If you are experiencing any tooth pain or other symptoms of tooth infection or abscess, contact Dental Expressions. Located near Kaukauna, we serve the Fox Cities, including Appleton, WI, and we’re convenient to Green Bay as well.